This morning I sat at my kitchen table and observed one of several stray cats that consider my deck their home. I had just uncovered the cage where my zebra finch, Muffin, had taken a long winter’s nap. I had given her fresh water and her daily portion of seed. She was in birdie heaven. I’m telling you…when I take the covering off her cage every morning and open wide the curtains to let the sun in she becomes an instant song bird. She takes a bath, flapping her wings and preening her feathers. She eats, tossing her gravel and flinging her seeds. And then she sings some more. Muffin…no, I didn’t name her…may live in a cage, but somehow she doesn’t seem to mind. It’s all she’s ever known. 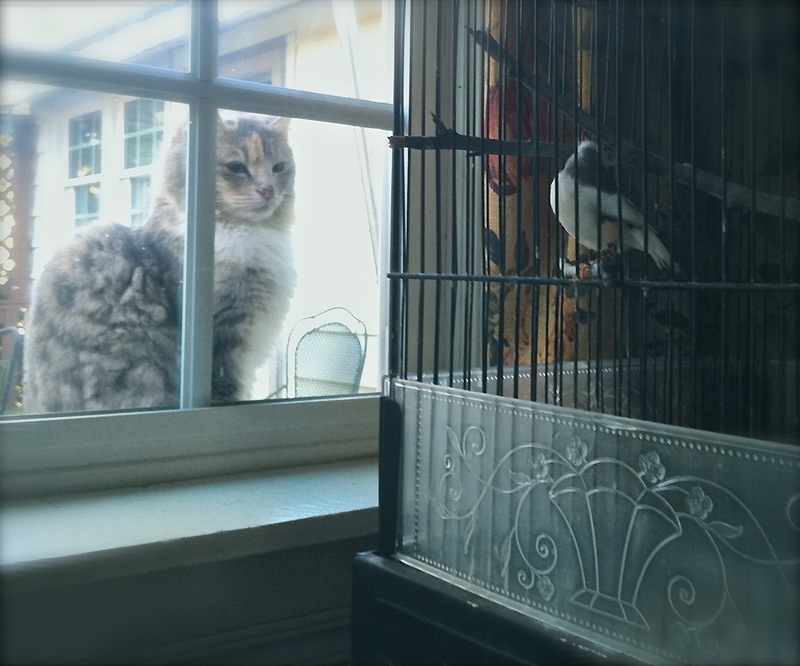 I guess if I propped the cage door open she would fly away, but she wouldn’t get very far. She would still be confined to the walls of my kitchen. I guess you could say, she’s well protected. Protected from stray cats, a finch’s worst enemy. As I watched the enemy watch his prey a powerful truth washed over me. That cat sat right there at the windowsill for a good hour hoping to make a meal out of my Muffin. She was a mere foot away from his piercing eyes and he couldn’t touch her. All of a sudden I found myself laughing. How often does the enemy sit at my window and watch me, unable to touch me because I’m protected by El Elyon, God Most High? There’s something in this verse profoundly significant. I have to dwell in the Shelter to be protected. I need to trust the Almighty to know what’s best for me. He sets boundaries for me because He knows I’m easily tempted and easily lured away from His protective covering. He doesn’t keep me in a cage, though. He gives me free will, but as long as I choose to dwell…to make my home…in His place of safety I’ll find the rest I desperately crave. The kind of rest that says I. Need. Not. Fear. Sometimes it looks awfully tempting on the other side of the window pane. It’s easy to think God is holding out on me, but I’ve been on the other side of that window and I can tell you…the enemy has some pretty powerful claws and some mighty sharp teeth. He can do some serious damage, too. I’ve been wiped out by flying solo without the Almighty’s shadow hovering over me. It’s much nicer flying with the wind of the Spirit guiding me. Leading me where He wants me to go, guiding me to the place where His best waits for me. Not to mention, God’s protective power is no match for the enemy. God, My Shelter, shelters me. Covers me. Protects me. Yet, still gives me wings to fly. Wow. Every morning, He opens wide the window to my world and warms me in the Light of His Son. He gives me an abundance of Life-Sustaining Water and the Bread of His Presence. He meets my every need. What can I say? I’m in birdie heaven. And when I look out my window, most days I don’t even see the enemy. He may be watching me, but I’m too busy flapping my wings, preening my feathers, singing a song, dwelling in the Shelter of the Most High and resting in the Shadow of the Almighty.